As lighting designers we find ourselves justifying, across many fields, the value of what we bring to a project. Due to the perception of high cost, we tend to find ourselves working on mid- to high-end projects, whether that’s retail, residential or hotels. While the experience of working on projects across different sectors is great, I sometimes find myself contemplating… how can I use my lighting “powers” beyond projects that only a small percentage of the population can benefit from and/ or enjoy? The more I delved into this idea the more I uncovered. One of the most startling things being that more than 1.3 billion (that’s right, billion) live in light poverty. People living in this type of poverty have inferior living conditions and fewer opportunities due to their lack of access to adequate lighting. As a result, they resort to inefficient, primitive lighting sources, such as candles and kerosene lamps, which are not only expensive but also a danger to life. Light is slowly being recognised as a basic human necessity, alongside water, food and shelter. The term “light poverty” is defined as having limited access to artificial light, which is usually associated with the traditional concept of poverty that relates to water, food and shelter. 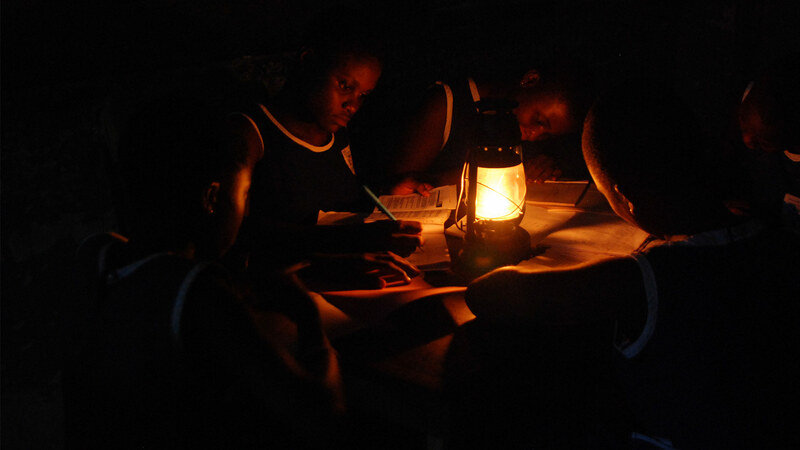 Power is one of the biggest barriers in resolving light poverty in developing nations. Wires, cabling and electricity are just not viable due to cost and resources. This goes beyond personal lighting use. It expands to wider public infrastructure issues, with many African countries having a complete lack of street lighting, making it extremely dangerous to travel in anything but clear and sunny conditions. As a designer I’ve observed that most advances in lighting design are generally developed around Western implementations…the latest efficiencies, optics and aesthetic designs. However, there’s only a small proportion of the world that will ever get the chance to experience the full benefits of these innovations. Over the past few years there have been a number of creative, off the grid lighting products that have been developed to help those in developing communities: Little Sun, GravityLight, LuminAID light and Liter of Light, to name a few. In Africa alone, 35 million people have obtained better energy access because of non-polluting solar-LED lights. There has even been the creation of the Global Off-Grid Lighting Association (GOGLA), which is helping to foster market growth. While these are breaking some ground for light poverty, I thought to myself how could I help with this problem? An opportunity soon after this presented itself to me to attend the Gambia Hornchurch International Scout Project – an ongoing mission in the Upper River region of the Gambia. I was to attend as a leader alongside a team of 16 other leaders and 38 youth members aged 18-25. One of our projects was to renovate the maternity wing of the Basse Health Centre, including the replacement of all the lighting. I became a part of the electrical team, whose responsibilities were to buy, design and install the lighting system. Before the trip, mothers giving birth in the evenings would do so by candle or phone light. This understandably is not safe for the mothers, the babies or even the medical staff. Even just a simple lighting solution would clearly make a big difference to the local community who use this hospital. Despite (at the final hour) not being able to partake in the trip, at the time of signing up I was really inspired, brainstorming and considering out of the box ways to contribute. My first idea was to seek the donation of fittings from manufacturers. Seems simple, right? While it was easy to get people on board, the difficult thing then became the shipment of fittings. The import tax and the high chance that we could “lose” the fittings on route in the end negated the efforts of the donation. Another factor that I hadn’t considered was the impact on the local economy. If we were to ship everything in from abroad, no money would actually enter the economy for the purchase of goods. We discovered it would have a greater social impact to use donation money to buy what was available locally. In the end the scheme was paired back to simple bare fluorescent battens with solar panels, and I’ll be honest, I was a little disappointed. I knew this wasn’t 100% right for typical hospital environments from what I had learnt from my workplace experience. These weren’t going to be quality fittings that were dust rated for operating theatres. But sometimes, as they say, something is better than nothing. Rather than dwell on the failure of the ideas, I focused on getting behind our team’s solid second plan. I set myself a personal fundraising goal to cover the total cost of the lighting and the solar panel system. Although, sadly, I wasn’t able to attend the trip, I still managed to reach the financial target I’d set, and despite never setting foot inside the walls of the Basse Medical Centre I still feel that I made a difference. As an industry I feel we can do more for those who don’t get to experience the complexities of light in the way we do. Even simple interventions can create a safe and secure environment. It can improve health and education. It can create a lasting impact. So I challenge designers to think of lighting beyond work, beyond the glitz and glamour. Think of lighting as a basic human need and how we can use it to change the life of others without it.